On Thursday, a tweet from HTC VP of Product Management Mo Versi broke the hearts of countless HTC One (M7) owners when he said that the phone would not be updated to Android 5.1 (except for the Google Play edition of the handset). After all, HTC's guarantee covers two years of updates after a device is launched, and the former flagship had already been on a magical journey from Android 4.1.2 to Android 5.0 in that time span. But Friday night brought a new tweet from the executive. In this message, Versi said that he had heard all of the comments from One (M7) owners who own a carrier branded model of the device. He noted that most of the bug fixes to repair issues caused by the Android 5.0 update are already baked inside HTC's current software. He also added that he understands the concerns of One (M7) owners, and closed by giving them a ray of hope offered by two words, "Stay Tuned." If you're thinking that HTC won't back down from its original decision, there is precedent for a reversal. Back in June 2011, the company said that the HTC Desire would not be updated to Gingerbread 2.3 even though it had been launched only 14 months before. 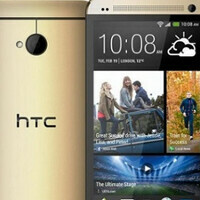 HTC cited the small amount of RAM inside the handset (576 MB) for coming to this decision. But enough complaints ensued, and HTC ended up removing some of the apps that the phone came bundled with in order to shoe horn the update into the phone. With 2GB of RAM on the HTC One (M7), short term memory is certainly not an issue here. If it is just a matter of the two-year guarantee coming to an end, the image conscious manufacturer just might decide that it is worth earning the faith and trust of all those HTC One (M7) owners by sending out the update after all. In addition, as the next few months unwind, those who bought the device signing a two-year contract could be looking for a new phone. HTC certainly wouldn't be hurting itself by updating the One (M7) and giving owners of the device a good feeling about the company. It might make a difference with those having a hard time deciding between the new HTC One M9 and the Samsung Galaxy S6/Samsung Galaxy S6 edge. Is HTC planning on reversing its previous decision? If what he says is true, then the update to 5.1 won't change anything. If many of the features in 5.1 are already in the current build of Sense, why update? Do the consumers really need that extra 0.1 to feel good about themselves, even though their current build has most (if not all) the improvements already? Even if the phone is capable of receiving more updates (which it is), support for it is taking away developer resources that could be going towards the M8 or M9. Nobody should blame HTC for wanting to focus on their more relevant devices, and anybody who does is just unreasonable. They kept the promise made in their Advantage program, the M7 has been supported for 2 years now. Their commitment to the device can, and should, be let go; all of their obligations have been fulfilled. People need to realize that companies can't support old phones forever, even if they are capable. Stop being so butthurt and let HTC's development team go on to bigger and better projects. Nooo,companies should definitely support their devices 2-3 years, anyone who thinks that HTC "fixed" android 5.0 with their sense overlay is wrong.Android 5.1 is a much needed bug fix update and is what lollipop should have been from the start.So there is no hardware related reason why not to update. For example my Nexus 4 runs lollipop totally smooth and I'm sure the same will be true for 5.1 it's great seeing companies extend product life cycles because today's phones have stronger hardware then software. Stay tuned just means "we'll think about it". Although it's impressive the amount of support the device has received from HTC.